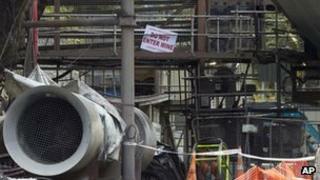 A judge in New Zealand has found a coal mining company guilty of safety breaches over a gas explosion in 2010 in which 29 men died. The judge found there was a direct link between the safety breaches at Pike River Coal and the deaths of the miners at the South Island colliery. At sentencing in July the company, now in receivership, could face fines of around NZ$2.25m ($1.89m: £1.25m). The former chief executive Peter Whittall faces a separate trial. He has pleaded not guilty to 12 charges. Judge Jane Farish ruled that the company had failed to ensure the safety of its workers. "In this case, there were fundamental breaches of the Health and Safety in Employment Act which led to the unnecessary deaths of 29 men," she said in her judgement. The mining disaster was New Zealand's worst in almost a century. The judgement follows an official investigation last year, which found that Pike River Coal failed to spot danger signs as it tried to boost production at the colliery. The commission of inquiry found that the 19 November blast at the mine, on the west coast of the South Island, was caused by a methane gas explosion. What went wrong at mine?